Since you have decided, like Hamlet, "to be" instead of "not to be" (otherwise you would certainly not be reading this), the next important question is "to do or not to do?" It is much easier to just exist and go with the flow (i.e., "not to do") than to overcome one's laziness and to do something. For example, nature photographers or mountaineers have to bring up the energy to leave their warm and comfy bed (or sleeping bag) in the middle of the night, when it is dark and cold outside. If the weather is bad or uncertain, the activation energy required to overcome one's comfort may seem almost unsurmountable. Snow, fog and rocks in the "Kreuzberge" (Chrüzberg). I was visualizing a scene like this all along our hike on the ridge and in the fog. When we arrived at the spot with this view, I only managed to take one single photograph before the fog swallowed the whole scene. For a family of five, the number of "free" weekends is very limited. Last weekend was such a rare occasion and therefore we had planned a trip to the mountain Hoher Kasten (reached by cable car from Brülisau). The summit of Hoher Kasten is the starting point for a beautiful panorama hike that brings you in 3-4 hours of ups and downs, and after many breathtaking views down to the river Rhine, Germany and the Austrian alps, to the mountain hotel Bollenwees. Unfortunately, the weather was, like so many times this year, not perfect. We hesitated whether to leave or to stay at home and not everybody was looking forward to the prospect of hiking in the rain. When we arrived in Brülisau, rain was pouring down and no mountain was visible. However, after a picnic in the car it had cleared up and we decided to take a chance and boarded the cabin of the cable car. 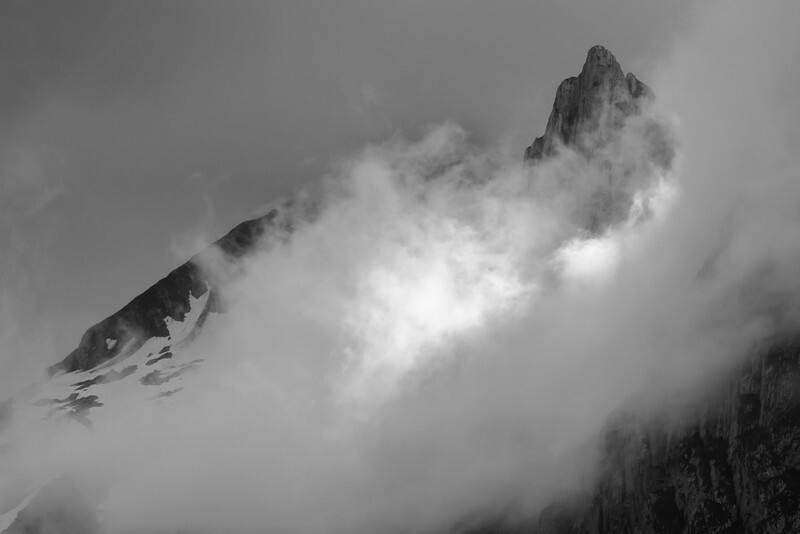 For a short moment, the clouds and fog cleared and revealed the rocky summit of the "Altmann" - and a beam of light also passed through the clouds to "complete" this photograph. Our gondola soon disappeared in a dense cloud and all the way along our hike on the ridge we could only imagine, but not actually see, the beautiful view. 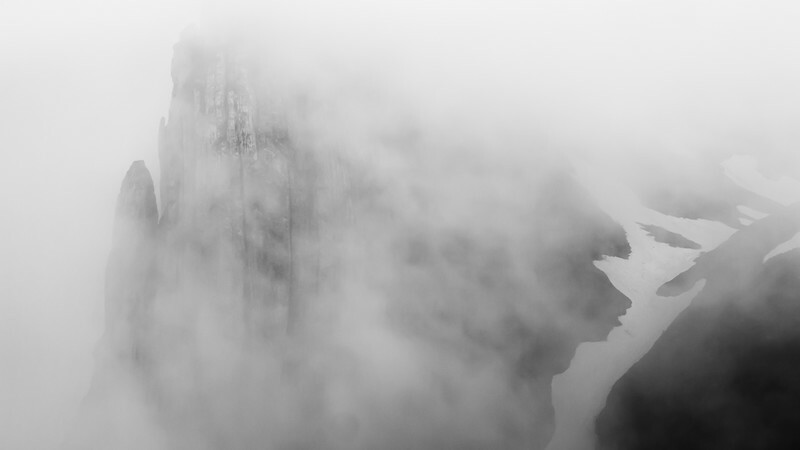 We only caught short glimpses of the breathtaking view when holes in the dense soup of fog formed. However, the lush vegetation and bright alpine flowers, covered with rain drops, were compensating for the lack of a view and accompanied us all along the way. Also due to the inhospitable weather conditions, less hikers were en route and we obtained a room at the Bollenwees on short notice (often this guesthouse is booked weeks in advance). The quietness was probably also the reason, why two alpine ibex, still in their winter fur, grazed next to the hiking path (two hikers in front of us alerted us of their presence). Two alpine ibex, still in their winter fur, in the Alpstein massif. The two animals were busy devouring the fresh leaves and hardly took notice of us, even though we were only about 10 meters away. There are many pictures stored in my brain that I will keep as good memories of this trip and the photographs above show three actual photographs that I managed to take as well. I even think that conditions like this, with quickly changing weather conditions, moving clouds and appearing and disappearing views and beams of sunlight, can render the experience of such a trip much more memorable and "special". My conclusion and advice is thus to always try everything to overcome one's laziness and to do "something" irrespective of the weather - it is (almost) always worth it! Leutschenbach school at dawn. 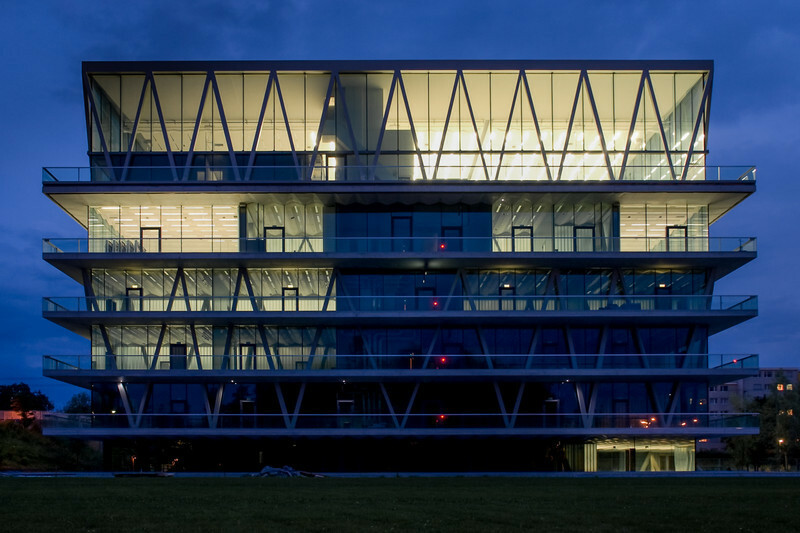 The Leutschenbach School is a minergie building in Zurich that was designed by the architect Christian Kerez and finished in 2009. Most walls and the facade of this fascinating construction are transparent or semi-transparent and the entire top floor is a gymnastic hall. Sometimes, I am gripped by wanderlust and long for remote places and adventures far away from my everyday routine. Such feelings overcome me particularly in moments when I think of pristine nature and remote places. However, this longing for wilderness in foreign countries has somewhat abated in recent years. The turning point was when I started to photograph where I live instead of only on occasional trips to the mountains or on holiday. Although I have always been attracted by geometric patterns and man-made beauty, for a long time I have not considered it worthwhile photographing such subjects. An early example of a man-made beauty photograph that I still like is the school building shown above. On a Saturday morning I had seen from the train that several people with huge tripods and view cameras were photographing it. Out of interest, I passed by in the evening and there was still one photographer left. It was the weekend before the building was being opened and he took photographs with different floors and sections of the building lit up. I was even offered to have a look at the building inside and climbed all the way to the top. What a nice building - the top floor is the gym and the glass walls permit terrific and far views over the north of Zurich. For the first time ever I regretted not being a pupil anymore! Since then, I have returned to this beautiful school and to other buildings in my neighborhood regularly and I have started to take more and more photographs. As soon as I started to regularly photograph in my man-made habitat, I became aware of things I had never observed before, which encouraged me to photograph more, which made me look even more carefully and consciously, and so on. I had entered an upward spiral of positivity! This blog post is the starting point for a new "nearby" series and gallery highlighting the fruits of this spiraling. It is my utmost concern to emphasize and to try convincing you that moderation can make you a better photographer (and a happier human being). Moderation not only concerns equipment purchases, but may also - and this is the topic here - apply to traveling to distant and famous places. I will try to convince you that interesting subjects can be found nearby your home and that the closeness and the intimate knowledge of your environment will open your eyes and thereby reveal subjects that an occasional visitor would never notice. Like the photograph above, all compositions that will be shown here were captured nearby where I live, in Zurich, within walk, bike or public transport distance of my home. Since I live in the northern part of the city of Zurich, which is called Oerlikon, the large majority of the photographs are from this area. The photographs will reflect the different themes that I have been or am pursuing - lights and shadows, reflections, facades, or other intimate details of man-made beauty (a few "Zurich-photos" have already been featured). I hope that you will find the mixture interesting and that one or the other photograph may encourage you to seek subjects that are close by. I am sure that it is worth it, because you will take your best photographs in the environment that you know best! Previously, buying a camera was a fundamental decision; opinions, even beliefs, were questioned and sometimes clashed. In fact, it was much more than the choice of a specific camera, but rather of a whole photographic system because most lenses could only be mounted on the cameras of one brand. Depending on your preferences and needs, compact system cameras (CSCs) may have largely eliminated such difficulties. CSCs are incredibly practical and versatile, because of their short flange focal distance and the consequential ability to mount and use virtually any lens that has ever been made via an adapter - irrespective of the brand. Admittedly, most lenses can only be used in manual focus and stop-down metering mode, but thanks to the electronic viewfinders this application hardly poses a problem. Many photographers actually appreciate using old lenses on modern digital cameras. Currently, the demand for some "famous", old lenses seems to have risen to such an extent that the prices are considerably higher than a few years back! Me too, I really enjoy using old, manual lenses (as recently mentioned) and hardly ever miss the autofocus feature for my type of photography. I rather long for the smooth manual focus of the old lenses when using my "modern" lens! In order to illustrate the plethora of adapters and to help you find an adapter for your camera-lens combination, I have prepared a lens adapter table (the original Google spreadsheet may be more practical than the scrollable table below). Currently, I have only included a (personal) choice of camera mounts and lens types. If you miss a particular combination, please contact me; I intend to update the table in the future! The two top rows (in blue) indicate the different camera mounts and their flange focal distances. Below these two rows, the left column (yellow) features the different lenses. All combinations, for which I have found adapters, are highlighted in yellow and feature a hyperlink to a dedicated hyperlinktionary page, where you find further links that help you find the particular adapter you are searching for. I hope that some of you find this information useful. In this scene, I was fascinated how the corrugated facade in the back seamlessly fades to its reflection on the car roof. The reflections in the side windows remind me of zebras. I have taken this photograph on a recent evening photo bike ride. I had been cycling around for a while without creating any photograph and nothing seemed to really catch my interest until in discovered this car. 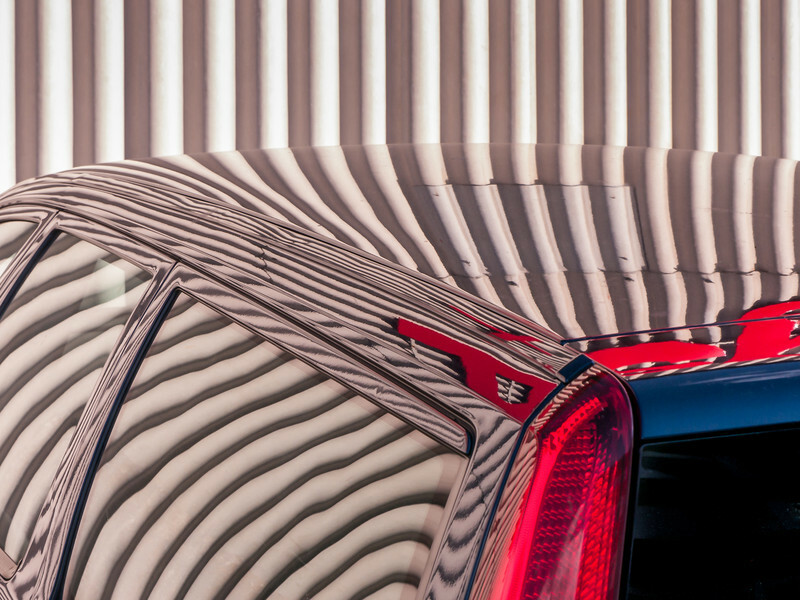 There were two cars next to each other, but this model had a larger and flatter roof with a much more impressive reflection. I also like the black lower right corner formed by the trunk of this particular car. If you want, have a look at the other blog posts in my carcolors series or visit my carcolors gallery. If I look at this black rectangle I see a perfect moment that is imprinted in my mind. The main subject is recorded in every detail and stands out from its surrounding like no real photograph could ever record. This black shape is thus a container that is filled with my memories and I hope that all of you have similar pictures that miraculously appear when you look at this frame. We are buried in an avalanche of photographs. All kinds of digital cameras, mobile phones and now even glasses record almost every aspect of our lives and enable us to take more photographs than ever (as previously mentioned). In the light of such an over-abundance, it seems appropriate to shine a light on the opposite: the photographs not taken. I have meant to write about photographs that were not taken for a long time. Finally, I feel inspired to do so - not only, but also - because I have just discovered that there is even a nice little book on the stories behind photographs that were not taken (The Photographs Not Taken by Will Steacy). The reasons for not taking a photograph can be manifold. You may primarily think of technical reasons - a forgotten or malfunctioning camera, for example, or of a subject that vanished before you managed to pull out your camera. In the book The Photographs Not Taken, ethical quarrels are also cited repeatedly as the reason why the camera was put aside or not picked up. Finally, you may consciously choose not to photograph in order to experience an event or moment more deeply, or because the subject at hand can simply not be satisfactorily captured in a photograph. Photographers may regret their missed photographs. However, I disagree with the view that "these moments passed into oblivion" (as the book review in Lens suggests). Our brain is an incredibly powerful recording device. It focuses on those aspects that attract us and blends out disturbing elements without any photoshopping at all. A moment or glimpse of something beautiful, a flash, a sparkling light, or a look can be imprinted and fixed in our brains for many years or as long as we live. Revisiting these recordings in the personal image gallery of my brain makes me painfully aware of the transience and rareness of such moments. Sometimes, I may therefore look at these images longingly and more often than I would wish. However, these moments have been kept and are experienced much more deeply; not despite, but BECAUSE they have not been recorded by a camera. This tilt-shift adventure example is just meant to illustrate the diorama effect (miniature faking) that happens when the lens is tilted opposite to the focal plane of the subject to minimize depth of field. I am not very fond of such kind of photographs and it is therefore unlikely that I will show another example anytime soon. But if YOU should be interested in miniaturizing, take this picture of Geneva as an example that it is possible with the Mirex tilt-shift adapter. On the other hand, you can also just turn on your computer and apply a post-production diorama effect. You know that you are getting old(er) when you start talking about how things used to be. Lenses used to be made of solid metal and glass, and to have wide, rubberized focusing rings and a manually adjustable aperture. There also used to be a hyperfocal distance scale engraved on the focusing ring and the lenses were devoid of any computer ship, electronic contacts, or autofocus motors. If you long for the good old lenses and need somebody to blame for the change, point your anger at Auto Focus (AF). AF brought along electronic contacts and microchips and paved the ground for electronic apertures and diminishing focusing rings. None of these changes made the lenses worse or better - just different (and cheaper to produce). Luckily, if you long for aperture rings and smooth manual focusing, times have never been better. As mentioned earlier, the short flange focal distance of the new compact systems cameras (CSC) allows fitting all kinds of "old" manual focus lenses on your preferred CSC body. For me, using old lenses just for the sake of the handling experience and for nostalgic reasons is not satisfactory. The conveniences of modern, lightweight, small and extremely versatile zoom lenses by far outweighs the affection for the craftsmanship and touch of a "classical" lens. However, the Mirex tilt-shift adapter introduced earlier changes the equation in different ways. It expands the functionality of my "old" lenses beyond what they were capable of on the cameras they were intended for. In addition, the tilt-shift adapter extends the functions of my CSC body and almost becomes a part of the camera itself. The adapter has a lens release button, just like the camera has, and can therefore stay on the camera while different lenses are attached to take advantage of the tilt-shift function. The Mirex adapter has a Canon EF lens mount and therefore transforms the micro four thirds camera it is used on into a Canon CSC tilt-shift camera. This is particularly advantageous, because the Canon EF flange focal distance is shorter than the one of the Leica R, Olympus OM and Nikon mounts; to name just three. It is therefore possible to use any of these lenses on the tilt-shift adapter provided you have the appropriate adapter at hand. An even better solution are the Leitax replacement mounts that are screwed on top of the original mount and semi-permanently adapt your lens to the Canon EF mount. 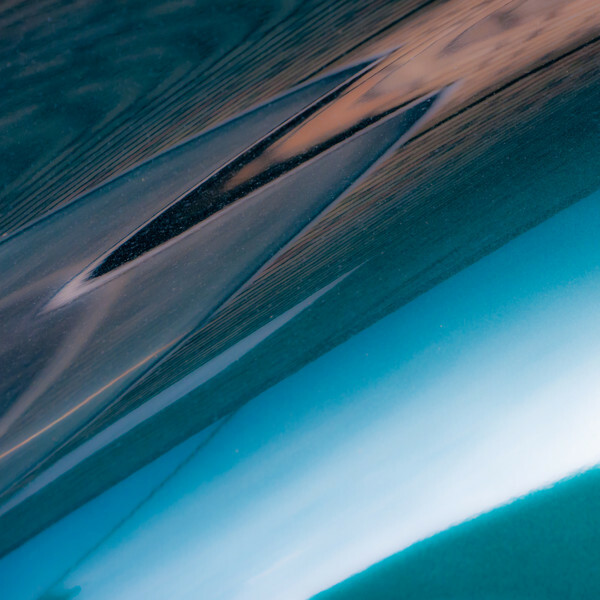 The first green carcolor composition to be shown in this collection of reflections and distortions on shiny car bodies. For once, it is also not a perfectly polished car body. Besides the bad weather that plagues Zurich at the moment, spring and early summer is a bad season for carcolor photographs because of the huge amounts of pollen that fill up the air. There is hardly a car without the fine dusty pollen cover to be found at the moment. 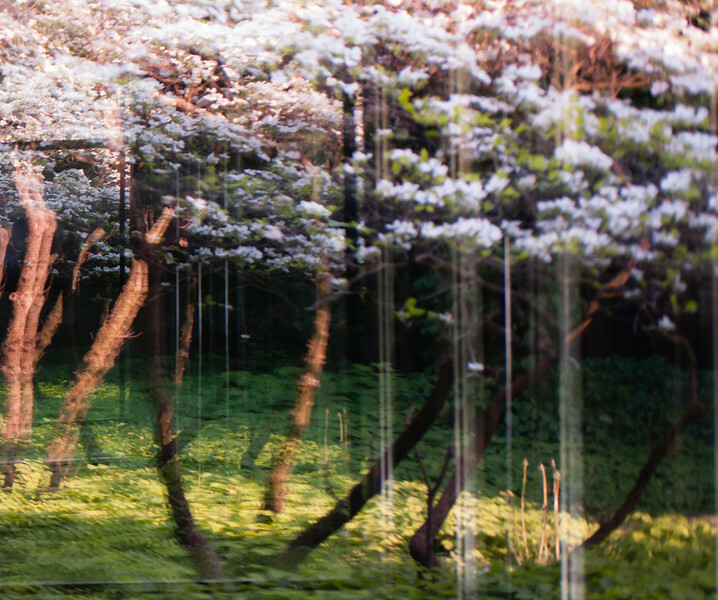 In the particular case above, the pollen haze even adds to the composition (at least in my opinion).